In the past few days I have been paying a lot of attention to the mobile platforms in general, including Windows Mobile, Apple Mobile devices (iPhone, iTouch, iPad) and also Google Android. I'm focused mostly on .NET technologies, but I always look at other platforms and cool stuff (I believe is always good for you to keep the perspective looking at other things you don't normally work with). Anyway, with the recent unveiling of the Microsoft Phone 7 Series (which by the way have kept me quite busy) I have been trying to learn how to develop for other mobile platforms. Android is an interesting case and I have been talking with my colleagues that are actually developing for Android, but I haven't had the change to actually get my hands on the Android development platform. On the other side, I'm attracted to iPhone development and I wanted to give it a try (is going slow, but steady). At the same time, I have been talking with several colleagues from different platforms about the benefits of each of the platforms, the obstacles and the resources while looking at the market behavior and trends. During these conversations one of my colleagues asked me if I use Google Analytics and if it could detect and report mobile traffic. It was something I didn't think about before, so I went right away to my Analytics account to check my blog's traffic. As you can see in the image above, for a "X" time of period I'm actually able to see the mobile traffic coming into my blog. I'm able to detect the mobile device OS visits and the mobile device browser used during those visits, which I think is really handy if you are getting into the mobile platform. I know many people are already aware of this, but I wanted to take the opportunity to share it with the people who didn't know about yet. I can’t believe you can get all this information from your site's traffic for free, so go ahead and start taking a look at you mobile traffic metrics!!! 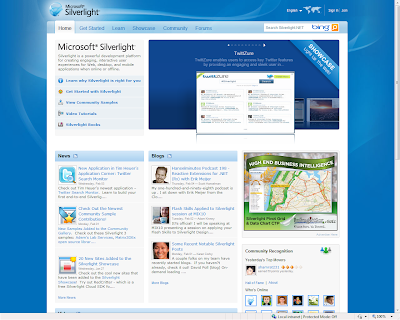 I’m thrilled to announce that TwittZure (silverlight Twitter client running on Windows Azure) has been posted in the Silverlight site application showcase. 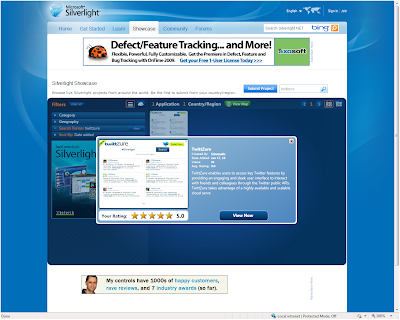 This are great and unexpected news and I’m very proud of it since it is being showcased in the Microsoft's Silverlight official site and it is currently on the very “First Showcase Position” !!!! WOOOOHOOOOO !!!! Stay tuned for future enhancements, we are working on improving the application to make it more intuitive and easy to use and more compelling to users.